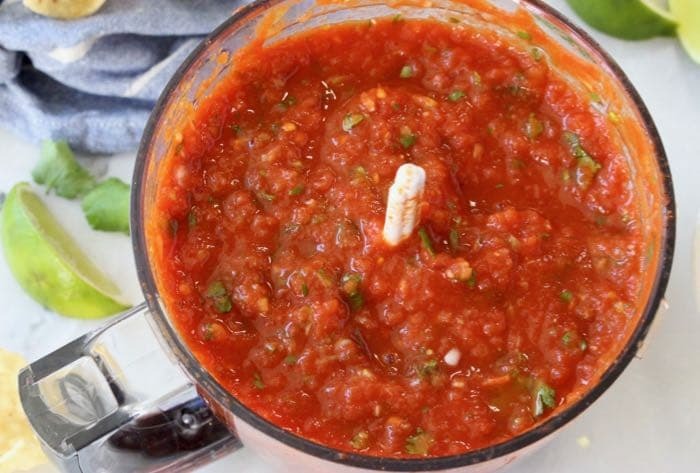 Easy and healthy, the best salsa recipe ever, ready in 5 minutes, made with fire roasted tomatoes and an authentic touch of cumin. The perfect quick and easy 100% whole foods plant-based vegan dip appetizer to bring to a game day party or backyard barbecue. I can’t count the times I’ve been asked this question and so here goes an entire blog post about it. 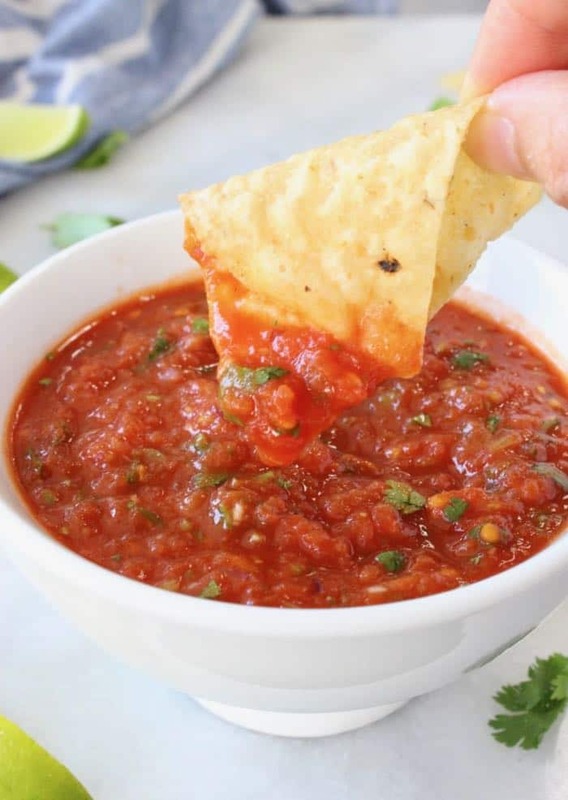 Yes, homemade salsa is good for you friends! 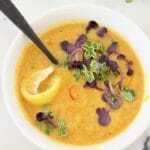 An oil-free, low calorie food bursting with flavor and loaded with micro nutrients our bodies need to thrive. You control what goes inside! Lycopene loaded tomatoes, spicy chili, flavorful garlic, scallions, fresh cilantro and citrusy flavor make this an absolute favorite food all year round. 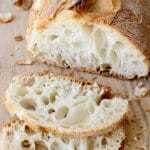 Use a food processor to whip up a batch, but pay close attention that you don’t turn it into a smoothie. If you prefer your salsa chunky, I’d suggest using a sharp knife instead and chop everything together by hand. Easy breezy, in any case it should be ready in about 5 minutes. 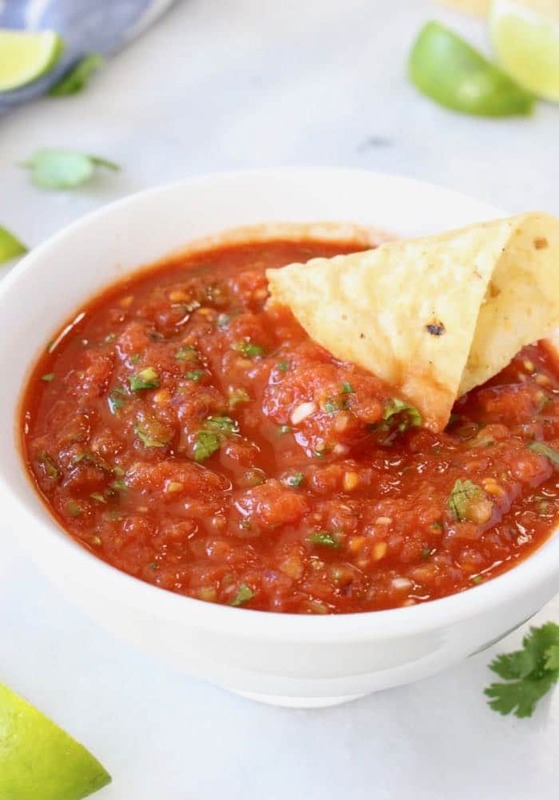 Also known as “ Salsa Roja ” this is a simple restaurant style red salsa, perfect for canning or serving right away with tortilla chips or as a condiment to a main dish. 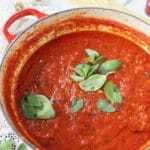 I’ll even use it as a sauce to toss with capellini noodles or drizzle it over steamed rice, beans and vegetables. note worthy: If you are wanting to make a “ Pico de Gallo “ style salsa then you must use chopped Fresh tomatoes instead of the canned variety. P.S. 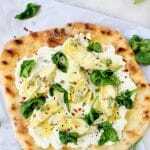 As always friends, If you make this recipe please come back here to rate it in the comments section, snap a photo and tag us with #VeggieSociety on Instagram! Namaste! 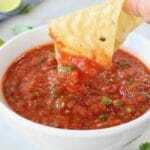 Easy and healthy, the best salsa recipe ever, ready in 5 minutes, made with fire roasted tomatoes and an authentic touch of cumin. Add the red onion, scallions, garlic and jalapeño to the bowl of a food processor. Give it a buzz or two until chopped. 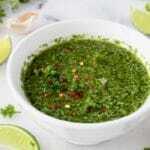 Add the tomatoes without juices, spices and cilantro on top and pour in the lime juice. 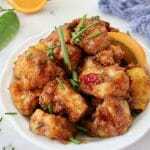 Transfer to a bowl and taste seasonings. Add more lime and sea salt if desired. At this point you can add the reserved tomatoes juices if you are wanting a thinner consistency. Add more smoked paprika for a deeper smokier flavor. Perfection, but why didn’t you tell me to triple the recipe ? Now I have to go back into the kitchen and start all over, gone in 60 seconds situation ?